and to make sure we are here! Call: (830) 964-3011 - Thank You! Music are LEGAL on the River at Tube Haus! is the famous "Horseshoe Loop"
Guadalupe River next to Tube Haus, in Canyon Lake, TX. 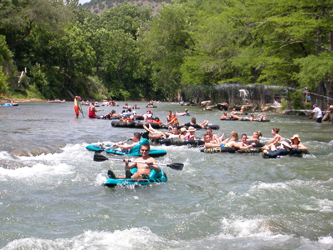 The Horseshoe Loop is one of the most popular places to float on the Guadalupe River! It is truly a unique, fun and awesome way to hang out, socialize, and meet new friends! This is one of the "Put-in" points where you can get in the Guadalupe River and float the "Horseshoe Loop" near Tube Haus! on the Guadalupe River. Tube Haus is conveniently located at the very beginning of the famous Horseshoe Loop! the river without being hassled by local Law Enforcement! beverages in cans or plastic bottles (please drink responsibly to insure your safety and of those around you). banned on the River, so no Styrofoam Coolers or Ice Chests or and type of Styrofoam items or Glass items are allowed on the river. Click here for a detailed description of the "2018 River Rules" in Canyon Lake compared to New Braunfels! How long does it take to float or ride down the Guadalupe River? See Guadalupe River Float Map below... The time it takes to float or tube down the Guadalupe River depends on which "Float Trip" you choose. Float times vary depending on how fast the river is flowing, measured in "cfs" (cubic feet per second). The higher the cfs, the faster the river is flowing, thus reducing the time it takes to float each Float trip as opposed to the lower the cfs, the longer it takes to complete your float trip. River Levels and flows can change daily, so the time it takes to float the river can change daily. Location "B" is the "Exit Point" for the "Short Float". Tube Haus customers floating the "Short Float" will exit the river right before the Bridge. (Note: If you are floating the "Short Float", do not go under or past the Bridge, get out BEFORE the bridge and walk up the foot-path from the river to the "Shuttle Pick Up Area" for Tube Haus.) 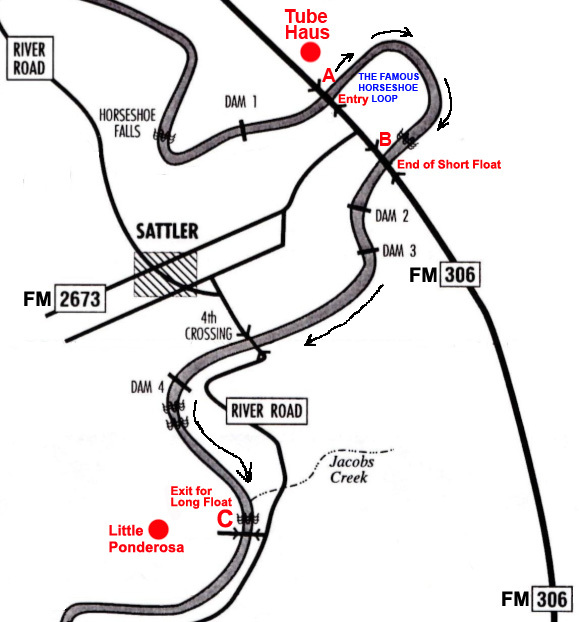 Customers who are floating the "Long Float" will float on past Location "B" and continue onto Location "C" past the 4th Crossing Bridge, all the way down to "Little Ponderosa", as shown on the Map. Location "C" is at the Little Ponderosa Bridge and is the "Exit Point" for all Tube Haus customers who are floating the "Long Float Trip". Customers will exit from the river at Little Ponderosa and take the Shuttle back to Tube Haus. Float Time: About 1 to 2 hours depending on River Levels. Long Float - (Subject to River Levels) (about 4 miles in length) Float Time: About 5 to 6 hours depending on River Levels. Note: River Levels can vary from day to day which will have a direct impact on availability and on how long any given float trip will take to complete. We suggest that you ask anyone on the Tube Haus staff how much time your float trip will take to complete on the day you are floating to get the most accurate float trip time possible. 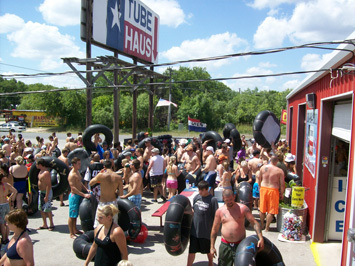 If you want to experience Texas River Tubing at it's finest, there is only one place to go... Tube Haus! Look for the BIG Texas Flag painted on our Huge Billboard and you'll find the best river tubing and float trips on inner tubes in Texas! We're located at the beginning of "The Famous Horseshoe Loop" section of the Guadalupe River, which is a 1 mile stretch of the river shaped just like a Horseshoe! (Click here to see an Aerial View of the "Horseshoe Loop" and then hover your mouse over the river.) As you look at the Aerial Map of the Horseshoe Loop, you'll see a Bridge at each end of the Horseshoe. If you hover your mouse over each Bridge, you'll see an "info tag" pop up. The Bridge on the left side the "Entry Point" is where you will begin your Float Trip. The Bridge on the right side of the Horseshoe is the "Exit Point" for our "Short Float", if you continue floating past that Bridge, you will float another 1 1/2 miles to the "4th Crossing Bridge" and "Take Out Point", which marks the end of our "Long Float". 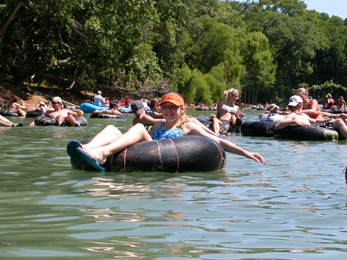 Floating down the Guadalupe River on inner tubes is fast becoming one of the most socially popular and fun ways to stay cool under the hot Texas sun all summer long! 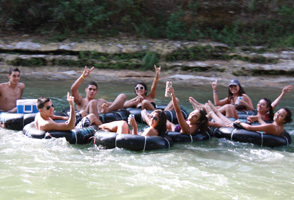 Click here for your discount "Guadalupe River Tubing Coupon"! There are 3 resorts close to Tube Haus that offer Cabins and Rooms, all come highly recommended! You can check them out by clicking on the links below. 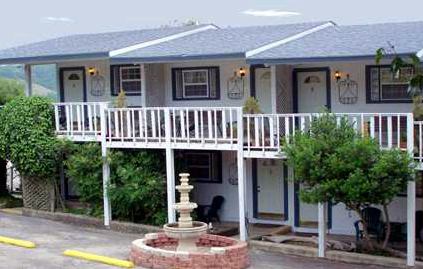 From San Antonio, you are just a short drive away from the beautiful and scenic waters of the Guadalupe River! See Ya When You Git Here!!! If you're looking for a great place to enjoy a Float Trip on the Guadalupe River with friends, family and your dog, Tube Haus is the Oasis you've been searching for. Tube Haus is "pet friendly" (referring to dogs) and you can find out the details in our "Tubing Checklist", see item number 16 at the bottom of the list for information about "tubing with your dog or floating the river with your dog" at Tube Haus, because a lot of dogs love river tubing and being in the water! 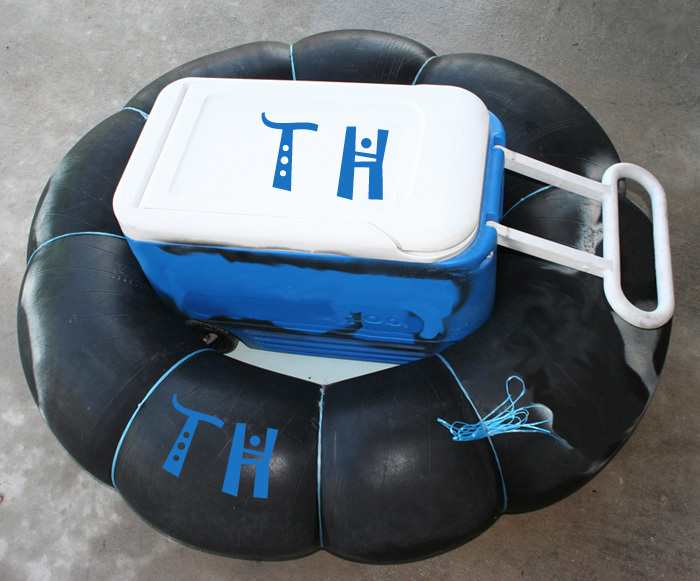 Tube Haus is only 13 miles from New Braunfels... just a short drive to the famous Horseshoe Loop on the Guadalupe River, where you can enjoy an awesome river float on inner tubes, with a cooler full of your favorite beverages and snacks! Our 3 biggest weekends of the Tube Season are Memorial Day Weekend, 4th of July Weekend, and Labor Day Weekend, and Tube Haus will be open daily for "Spring Break each year (weather permitting)", from 9am to 5pm. We highly recommend that you plan ahead for all 3 Holidays, especially if you need Lodging, Camping or an RV site because Lodging and Campsites usually book up pretty quick just before school lets out for the summer. Tube Season at Tube Haus generally runs from the first week in March through the end of September each year, however depending on the weather each year, this time frame may be longer or shorter... good weather allows for a longer season and bad weather shortens the Tube Season. 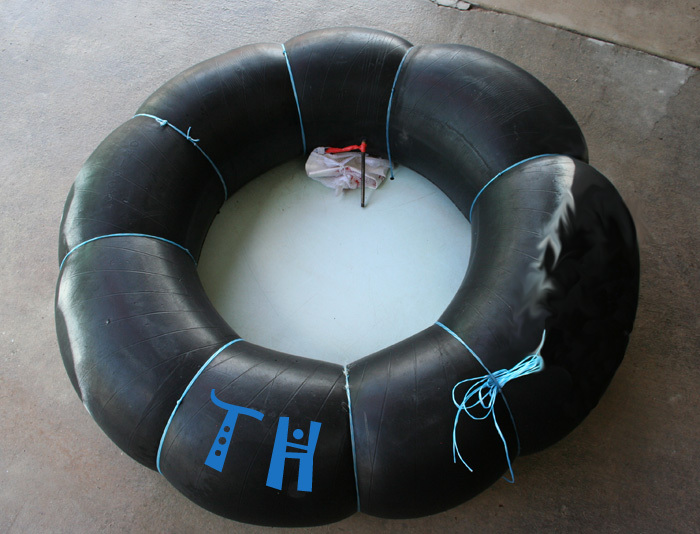 Tube Haus is one of the original Tubing Outfitters and Tubing Companies that began renting inner tubes back in 1978 on the Guadalupe River in Canyon Lake, Texas and now specializes exclusively in "Guadalupe River Tubing". From the very beginning, Tube Haus has always been considered one of the best tubing destinations in Texas. Tube Haus is located near New Braunfels in Canyon Lake, Texas, (on the famous "Horseshoe Loop"), which has been deemed the "Water Recreation Capital of Texas" by the Canyon Lake Chamber of Commerce. Tube rental fees cover all day tubing, parking and your return shuttle from our Long float... choose between our Long float or our Short float, or do both if you arrive early enough (our Short float does not require a shuttle, only our Long float requires a shuttle). Float times vary daily based on River Levels, River Conditions, and Release Rates that may change daily from the Canyon Lake Dam, please check with our rental desk for daily Float times (830-964-3011). 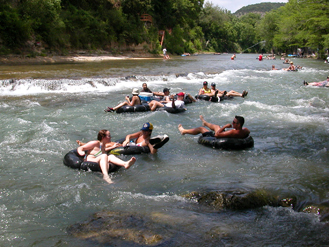 Guadalupe River Tubing is one of the most enjoyable River Sports on Tubes! We accept Cash, M/C, Visa & Discover. See our "Tube Rental Rates & Tubing Prices" for Inner Tube Rentals, Cooler Tubes, Tubes with Bottoms, Tubes without Bottoms, Cooler Rentals and a complete list of prices and don't forget about our "Tubing Coupon" for a discount on your tube rentals! 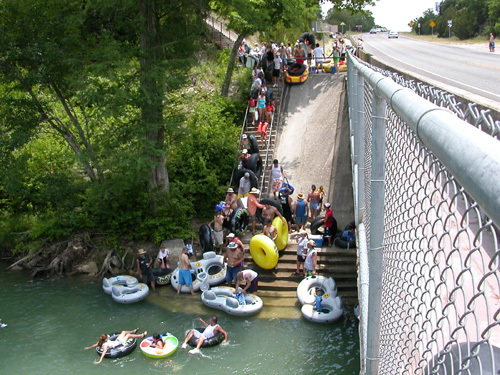 In 2007, 2010, 2011, & 2012, the New Braunfels City Council passed new River Rules, River Laws, Ordinances and Restrictions for anyone participating in River Tubing, Rafting or any other water activities within the City Limits of New Braunfels on the Guadalupe and Comal Rivers. These New River Rules, Floating & Tubing Laws, Regulations and River Restrictions stirred up the whole River Tubing community all over Texas and beyond! People were extremely upset and law suits were filed by local Outfitters in protest, which are still ongoing. A few of the biggest questions we get at The Tube Haus in our emails is... "What are the New River Rules and will they affect me when I go Tubing on the Guadalupe River in Canyon Lake?" Is there a "Can Ban" in Canyon Lake? Are there any Cooler Restrictions in Canyon Lake? The simple answer is NO! The New River Rules passed by the New Braunfels City Council only apply to water activities "within the City Limits of New Braunfels" and do not apply to the upper Guadalupe River in Canyon Lake, which is outside the City Limits of New Braunfels. The Tube Haus is located outside the City Limits of New Braunfels and thus you do not have to worry about any of New Braunfels' River Rules and/or Restrictions. Drinking is legal on the river and more specifically, it's legal to drink alcohol on the Guadalupe River in Canyon Lake. Tube Haus has posted a Chart on our Website where you can compare the New Braunfels' River Rules with the Texas State River Rules to see the differences. Basically nothing has changed as far as Rules are concerned on the Guadalupe River in Canyon Lake except for one New Rule pertaining to "plastic containers" mainly used for Jello Shots... check out it out here, the latest, most up-to-date River Rules: 2018 Guadalupe and Comal River Rules. P.S. Alcohol has not been banned from the Guadalupe River... please drink responsibly. In regards to Cooler Restrictions, there are NO Cooler Restrictions or Ice Chest restrictions in Canyon Lake... bring any size Cooler or Ice Chest you like and as many Coolers as you need! Note: There is a strict law which is heavily enforced for all rivers in Texas that forbids any kind of Styrofoam on the river, so please do not bring any "Styrofoam Coolers or products" with you on the river or you may be fined up to $500. Glass is also illegal on the river, so bring beverages and snacks in cans, plastic, or paper containers. 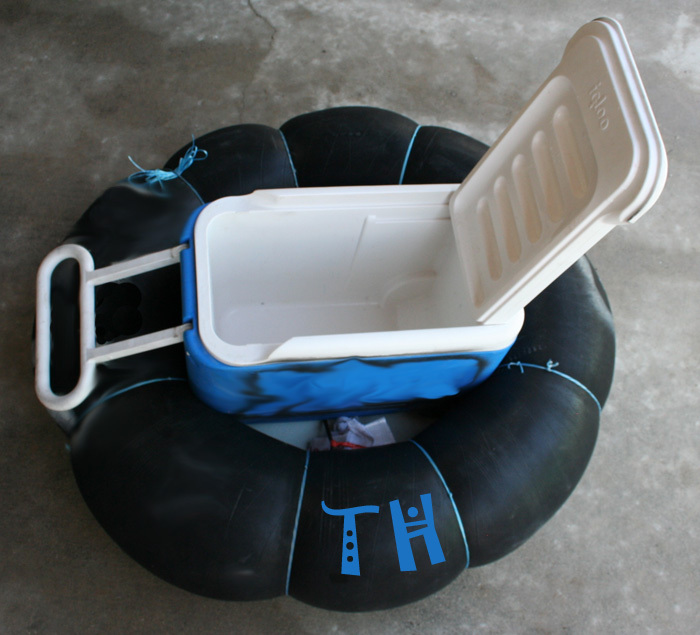 the size of your cooler(s) up to 50 quarts, (we like the 48 quart Coleman and Igloo Coolers or Ice Chests better than a 50 quart because they seem to fit better in the inner tubes). Here are just a few of the common tags, search phrases, misspellings and misspelled search terms and keywords that people use to find us: Tube House in Canyon Lake, Tube Huas, Toob Haus, River Haus, tube hass, tubehausa, tube rental near the horseshoe, Tubing in New Braunfels, TX., Tube Haus in New Braunfels, New Bronsville, TX, Tubing in Austin, Tubing in San Antonio, rivers in San Antonio, TX., best tubing guadalupe, inner tubing, Tubing in Houston, Float the river in New Braunfels, New Braunfels Tubing, "I wanna go tubing in New Braunsfield", new braunfels horseshoe, ride the river in new braunsfels, Canyon Lake Tubing, Tube Rentals New Braunfels, Texas River Tubing, tube ride, texas, tubing floats, Tube Rentals Canyon Lake, rent tubes, Tubing Canyon Lake, TX., New Braunfels River Float, Tubbing, Toobing, and Tubeing, gontubing, tubing rentals, guadlupe river, guadalupr river, guadeloupe river, gualope river hours, gaulpotia river,.guadlupe river swim, swimming, Alcohol inner tubing Texas, Where to go water tubing in texas? 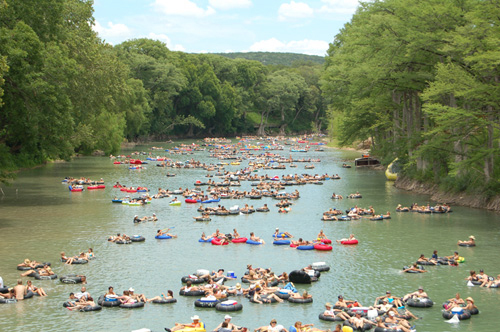 Where is the best place to tube down the Guadalupe River in Texas? Tube Haus is the best place to Based on what our customers have told us over the years, we find it very interesting that all these tags have one thing in common... everyone is using a different set of words to find the same thing... Guadalupe River Tubing or Guadalupe Water Tubing! Once people have found us, they just bookmark us, and add us as a favorite, or they just type in "tubehaus.com" and wallah, they're here! To be clear, Tube Haus is near New Braunfels (10 minutes), Tube Haus is near San Antonio (55 minutes), Tube Haus is near Austin (55 minutes) and Tube Haus is in Houston's backyard, (Map) just 3 hours and 18 minutes drive down Hwy 10 and TX-46 to Canyon Lake, TX., where the refreshing Guadalupe River is waiting for you and your friends to have an awesome day of floatin' down the river on inner tubes, kickin' back and sipping on your favorite beverage... Guadalupe River Tubing near Houston, Texas! The Guadalupe River is one of the main rivers to float and tube near Houston. P.S. Tube Haus will be open daily for the "4th of July Weekend 2018" as well as the "Labor Day Weekend 2018" from 9am to 7pm! Tube Haus, one of the best and cheapest places to go for Spring Break, Memorial Day Weekend, Forth of July Weekend, and Labor Day Weekend on the planet! Average Drive Times to Tube Haus from Various Cities in Texas: (Estimated Drive Times are based on "non-rush hour and non-holiday periods". Drive times will vary based on your starting point, number of pit stops, traffic, weather, road construction, accidents, detours, and other unknown factors.) Click here for "Easy Directions & Maps to Tube Haus"
coming back to see us year after year! If you don't see your city or town listed in the Drive Time Table above, or if you are driving from out of state, this little widget estimates the distance from the location of your computer to Tube Haus based on the location of your IP Address. Note: The distance you'll see is a straight line to the Tube Haus, it does not indicate actual road mileage. To figure actual road mileage, use Google Maps. Next, click on "Get Directions" and enter your address in the "B" entry slot. Google will map your route for you with your total mileage. How long is the Guadalupe River? The length of Guadalupe River (proper) is approximately 230 miles, however if you include the distance of the 2 originating forks (or branches) in western Kerr County feeding the Guadalupe River, it would be approximately 250 miles in length. The Guadalupe River "proper" is the point where the 2 originating forks join and where the 230 mile length begins. The Guadalupe River is one of the most popular rivers in Texas for recreational water activities, including river tubing, swimming, snorkeling, trout fishing, bass fishing, kayaking, canoeing, and rafting. The Guadalupe River headwaters begin north of Kerrville, TX and continue down past Victoria, TX to San Antonio Bay into the Gulf of Mexico. As the Guadalupe River twists and turns and winds its way through the Texas Hill Country on its way down to the Gulf of Mexico, by far the most visited and popular section of the Guadalupe River for water recreation and river tubing is the famous "Horseshoe Loop", which is a 1 mile stretch of the Guadalupe River shaped just like a giant Horseshoe and is located just below the Canyon Lake Dam and Reservoir, in Canyon Lake, TX. Considered the most significant reservoir on the Guadalupe River, the Canyon Lake Dam & Reservoir began construction in 1959 by the U.S. Army Corps of Engineers and was completed in 1964. The Guadalupe River is extremely beautiful and scenic, and provides water flow for recreational, domestic and agricultural uses throughout its entire length, from Kerrville all the way down to the Gulf of Mexico. The "GBRA" (Guadalupe Blanco River Authority) is the local agency (in Seguin, TX) that manages Guadalupe River Flows and Release Rates from the Canyon Lake Dam when Canyon Lake levels are at or below 909 feet Above Mean Sea Level (AMSL). When Canyon Lake levels are above 909 feet (AMSL), the U.S. Army Corps of Engineers takes over the management of Guadalupe Release Rates and River Flows as a "Flood Management Agency". In 2002, a massive flood event took place, breaching the Canyon Lake Spillway with such a powerful and destructive force, that it carved a huge "Gorge" just below the Canyon Lake Spillway, uncovering and exposing some incredible archeological finds and geological formations, prompting the creation of the Canyon Lake "Gorge Preservation Society" (GPS), who offer "guided tours" of the newly formed astoundingly beautiful Gorge! Spring Break at Tube Haus! - Tube Haus has been described as a "Top Choice" of "places to go" and "things to do" for Spring Break in Central Texas", also as "One of the Best Low Cost / Cheapest Spring Break Destinations in Texas", and finally, as "One of the Most Popular Places to go in Texas for a Spring Break Destination" by college students in Texas because... Tube Haus is uniquely located in the scenic and beautiful Texas Hill Country in close proximity to Austin, San Antonio and right next door to New Braunfels & Gruene, TX for some of the best night life in the entire USA! All 4 cities offer excellent night life and social activities in the way of great bars, dancing, live bands, music, entertainment and restaurants. In Austin, 6th Street and other adjoining streets are blocked off strictly for pedestrian traffic walking to and from bars and restaurants, just like a "Block Party" in the French Quarters of New Orleans. Austin's Music Scene is 2nd to none and features some of the best live bands anywhere in the world! Just 55 minutes south of Austin in San Antonio, you have the famous San Antonio River Walk, packed with bars and restaurants lining the banks of the picturesque San Antonio River. In New Braunfels, there are 2 areas offering great night life, bars, restaurants, music and entertainment... downtown New Braunfels, right smack in the City Square / Roundabout and adjoining streets, and the 2nd area is in nearby town of Gruene, Texas, which includes Gruene Hall, the oldest Dance Hall in Texas! 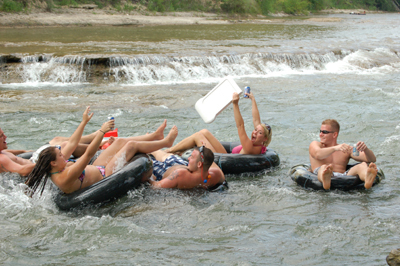 Most "Spring Breakers" come out to Tube Haus for their "Day Time Activity" and have a blast floating down the Guadalupe River on inner tubes with coolers filled with their favorite beverages and snacks (Alcohol is legal on the Guadalupe River). A very common question is: "Can you drink alcohol on the Guadalupe river? YES it is legal to drink alcohol on the Guadalupe River!!! After a day of tubing down the Guadalupe River, "Spring Breakers" head back to their hotels, hit a shower and then head to their evening destinations for dinner, dancing, music, and entertainment to round out their adventure filled day! Tube Haus will be open daily (7 Days a Week), starting on Saturday, March 10th, 2018 for Spring Break. Our Hours of Operation will be from 9am to 6pm throughout Spring Break, which usually runs through the first or second week of April... immediately after Spring Break, Tube Haus will switch over to Summer Operating Hours, which we will post right here on our homepage! See Ya When You Git Here! Cheers! Open daily for Spring Break beginning on March 10th, 2018. (Weather Permitting). Tube Haus will be open the entire "2018 Memorial Day Weekend", including Memorial Day from 9am to 7pm daily! Tube Haus will be open on "Independence Day" and the entire 4th of July Weekend 2018, 9am to 7pm daily! 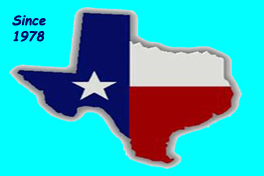 As always, please help keep our Lakes and Rivers clean for everyone's enjoyment, please "Don't Mess With Texas"! Stash your Trash! Information throughout this Website is subject to change without notice. Information may be time sensitive and become out-dated or obsolete. missing information, misunderstandings, misconceptions, misinterpretations, incorrect and/or out-dated information.